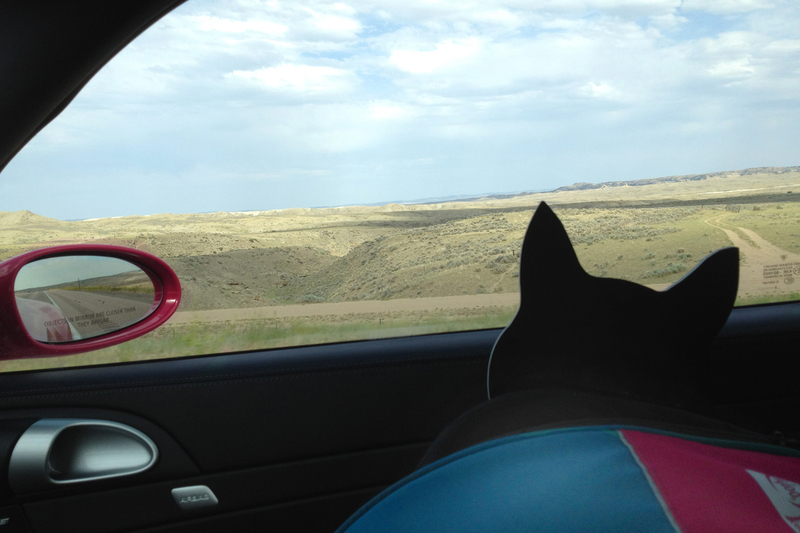 Glogirly and I are road tripping our way back home from BlogPaws. It's a LONG drive, but Cheese (our GPS Man) is doing a stellar job of keeping us on course. He gets a little miffed when we stop for gas. He's all, "In 100 feet, make a U-turn" ... probably wants to say "You're going the WRONG way...AGAIN!" And why do I have to share the seat with this stupid cooler? There's not even any flat salmon in it. We'll have much more to share about our BlogPaws trip, including the news of our big WIN, (woot woot!) once we pull into Minneapolis and unpack the swag-mobile. But Flat Katie needs some shut eye. Yeah, I know...pretty hard when my eyes are glued wide open. OK, OK...I won't leave you hanging. Glogirly and I won the BlogPaws Nose-to-Nose Award for BEST MEOW BLOG!!! That's Best Cat Blog for you dogs that don't speak Cat. We are SO excited and we owe it all to YOU - our fabulous friends! Without each and every one of you, we'd just be talking to each other...and how boring is THAT!? I want to give a big shout out to Jonesie from Cory Cat Blog for leaving the FUNNIEST comment on my Glogirly Facebook Page. 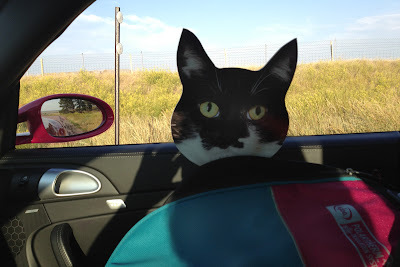 When she saw a photo of me road tripping in the passenger seat, she asked if "Flat Katie had a flat litter box for the car." MOL!!! If you want to nominate us for Best Video or Best Blog Post, you'll need the specific URL's. Click HERE for a list of our faves. No pressure though. It's all for fun. I know my human already congratulated your human, but I want to take the opportunity to say concatulations to YOU, Katie, because you human could NOT have possibly won it without you! That is the one thing that makes me wonder about BlogPaws - all these humans patting each other on the back when it wasn't even them doing all these awesome accomplishments! Well done my dear! Congratulatory cuddles are on their way! Woo hoo! Congratulations on your win! Just awesome and well deserved! And we thought Jonesie's comment about the flat littler box was pretty great. Congratulations on the win - very deserving. I was happy to see you win something and also CK. Unfortunately, we missed the live broadcast on the computor cuz M & D had to go somewhere. By the time they got home, it was over. Congratulations on the big win! Looks like you had fun in the car ride too! Car rides are the best!!! Yay, Katie on winning that award. Well done. We are so thrilled for ya. Can't wait to hear the rest of the news.Take care. I can't wait to hear all about BlogPaws! So glad you had a great time. MOL! Jonesie was SO curious about that litter box. Well, we all were. We can hardly wait to hear more about BP. They do have the BEST SWAG EVER! Congratulations again on your win! It was so great to meet you and get to spend some time with you. Safe travels the rest of the way home to you! Congratulations on the win! We're looking forward to your return home, and to reading all about BlogPaws! ConCatulations on winning!! Have a safe trip home!! Your win was well deserved Katie! concats on the Award AND on getting to meet plush ME. Have a safe trip home. Can't wait to read all about your girl's adventures. Next year Blogpaws will be back in VA and TW will be there. Hope you can make it. We road tripped in down there too! We drove from Seattle. Congrats on the Nose-to-Nose award! ConCATS on your award! Of course, we suppose Glogirly will try and hog all the credit. Looking forward to reading all about BlogPaws! Mom tried to watch on line, but couldn't understand what they were saying. and I love the flat litter box comment too! Congrats on winning the award! That's so cool. And we think it's funny you have to share the space with a cooler. Not so cool (ha ha). Congratulations- and I just saw that you were mentioned in the Modern Cat blog. Yea! Congrats!!! I am thrilled you won, you rock the kitty world! I am sooooo excited for you!!!! Woot!! Safe trip home GG!! Congratulations! We are so happy that you won!! Woot! Woot! Congrats! You always make us laugh. It was well deserved. :0) Too bad we didn't get a chance to meet you. We love kitty cats. We enjoyed our road trip down there as well. Hope you guys had a great time at Blogpaws, it looked awesome, wish there was one in Australia!! Another big congratulations on your Best Meow Blog Award. I know you were expecting to win all the awards...maybe next year. Tell mom we really enjoyed meeting her. Congratulations, we are so meowy (very) proud of you. well...this is at least the third time I am congratulating you but...CONGRATULATIONS! Thanks for translating from Cat language to me - It sure is confusing!! It was cool to see you winning your award!! Me has been doing the Happy dance for yous!